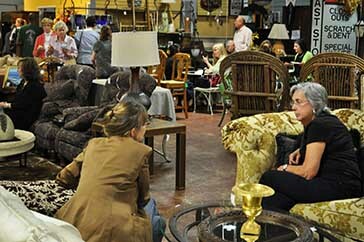 Atlanta's Film Industry is booming and furniture and decor at The Depot is regularly cast in television and film projects throughout each year. 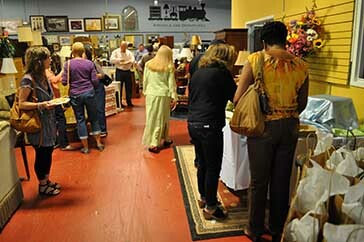 Hundreds of pieces have been featured in movies and television series and a large number of those items are resold back into our inventory after the shoot. 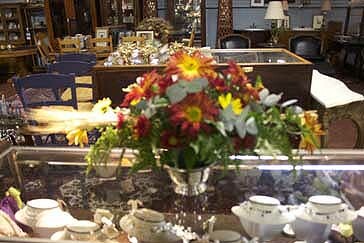 Shop at The Depot and you might wind up owning a slightly used star piece of decor! Our list of "credits" include Walking Dead, Good Girls, Dynasty, Drop Dead Diva, Various Tyler Perry Studios productions; Trip to Bountiful (PBS), The Blind Side, The Watch... just to name a few. We have also hosted scenes and cast members from such shows as Real Housewives of Atlanta and it's spinoff Don't Be Tardy for the Party. So you never know who might be stopping and shopping. 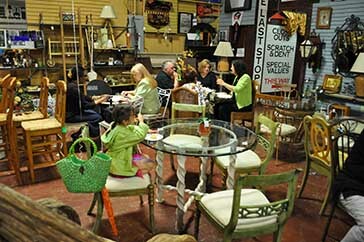 The popular series Tiny House Nation is one of the shows that shot scenes at our store. Host John Weisbarth and crew spent a day shooting a scene not long ago. You can stream the complete episode on the FYI website at https://www.fyi.tv/shows/tiny-house-nation. Look for Season 3, Episode 3, original airdate April 9, 2016. 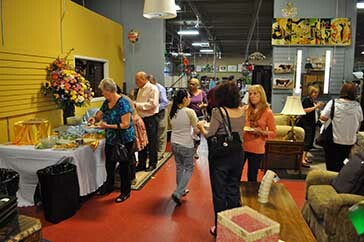 Consignment Furniture Depot is Celebrating it's 10th Birthday in 2018 ! We had a wonderful turnout for our after hours Fifth Birthday Party- especially when you consider we were under both a severe thrunderstorm AND tornado watch! 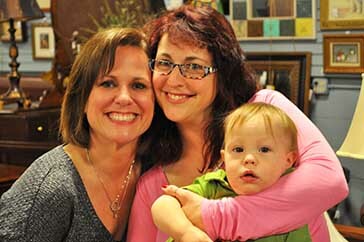 We want to thank our very loyal and dedicated party guests! 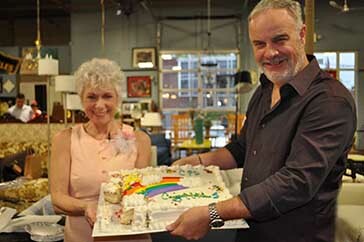 (Below) Victoria and Mark cut the cake as all sang Happy Birthday to end a great evening. Thanks for all who attended! Members of the Depot team all contributed appetizers while Bill Breuer provided his beautiful floral touches. 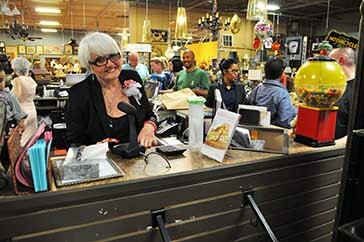 A special shout out to Margo for putting together all of the party favor packages despite a painful injury. She went to the hospital and missed the party AFTER she did the packages! 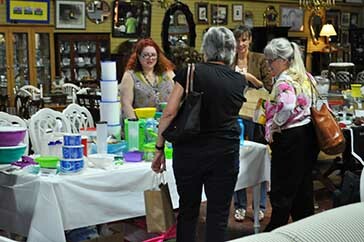 Our own Paula made some tasty Pampered Chef demonstrations while Christine featured Tupperware products (below left). Kim, Amy and Jojo strike a pose (below right). Marcia did her usual colorful job as our MC and called out the drawing winners (below left). 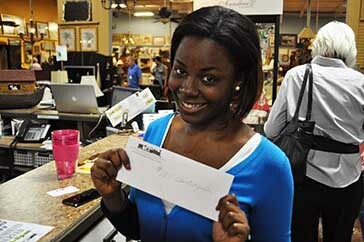 Party attendee Marie is shown with her check as the lucky $100 Depot Bucks winner (below right). The rain came and went quickly and all had a great time despite the occassional thunder and lightning. 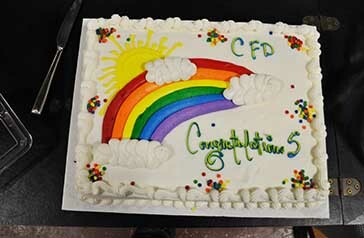 Thanks to everyone for coming to celebrate with us! Left to right... Marcia, Ronni, Andy, Maria, Victoria and Mark. Thanks to all of our many friends who attended our Holiday Soiree. 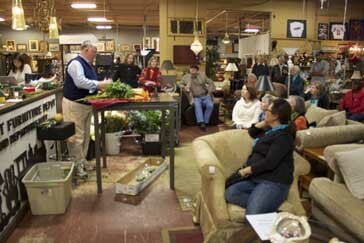 Bill Breuer's holiday floral centerpiece design demonstration drew a nice crowd. 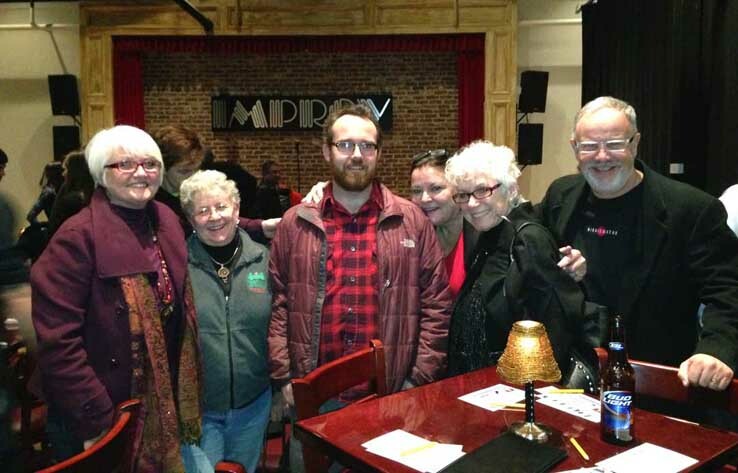 A few lucky attendees went home with his creations following a drawing and holiday serenading by our own Marcia Sanford. 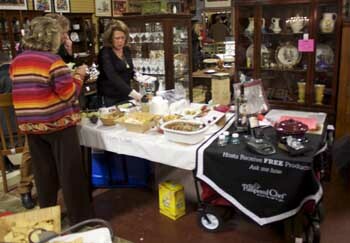 (Below Left) Our Pampered Chef Paula prepared tasty samples that disappeared in a hurry. 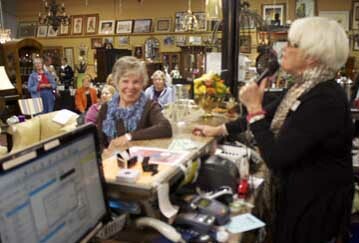 (Below Right) Marcia presided over the trivia contest and sang happy birthday to our long time customer Barbara Furbish.